The Riches - And the secound season started this week! George Lopez re-runs His mother just cracks me up. 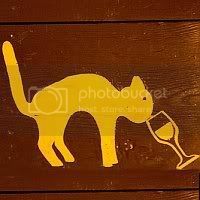 By the way, Julia, is that your cat in your avatar? So cute! Noh, that it is not my cat. Unfortunatley. I just found it on the internet. Recently I have fallen into "Regenesis". And his guest appearance on Reno 911 as the shamed drunk mayor? i'm a Top Chef girl...it's my two favorite things: food and drama. I'm LOVING the drama this season. Like, omg, did you see the promo for next week? It's gonna be juicy! The contestants are really impressive this season too. I bought season 1 last week for only 25 euros (50% off!) and now we both are addicted to it. Already been watching the first 6 episodes. i can see why i'm so busy lately..
And now I'll have to wait for season 3!!! Sarah, I think you would like "Breaking Bad". Have a look for it.